High-speed USB 3.0 Performance With write speeds of up to 15X faster than standard USB 2.0 drives, you can transfer a full-length movie in less than 30 seconds. Sleek and Durable Metal Casing The SanDisk Ultra Flair USB 3.0 Flash Drive features a stylish yet tough metal casing that protects the drive from unexpected knocks. A compact design makes it easy to slip the USB flash drive into your pocket, bag, or purse and bring your files with you anywhere. SanDisk SecureAccess Software Protects Your Privacy Create a private folder on your drive with SanDisk SecureAccess software. This 128-bit AES encryption software makes it easy to password-protect critical files. Drag and drop files into the vault, and they’ll be protected. Easy File Recovery with RescuePRO Deluxe Software The drive comes with a RescuePRO Deluxe data recovery software download offer. This software makes it easy to recover files that have been accidentally deleted (download required). 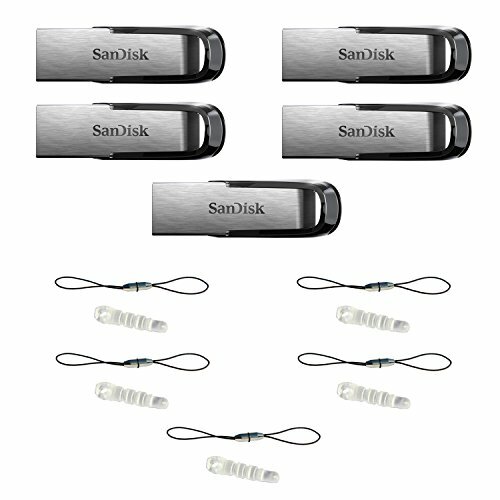 Compatible with USB 3.0 and 2.0 Ports The SanDisk Ultra Flair USB 3.0 Flash Drive is backward-compatible with USB 2.0, so you can plug it into any USB 2.0 or 3.0 port. Choose the Amount of Storage You Need The amount of capacity you need depends on the types of files you have, how big they are, and how many there are. The chart above gives you an idea of how many photos, videos, music and office files you can store for each capacity. Five High Quality Secure Detachable Breakaway Lanyard. Five High Quality TPU Flexible Dust Plug.